Our gastro travels on this week’s culinary tour brings us to Turkey, a country I love for its yogurt – a pot is always on stand-by in our fridge. 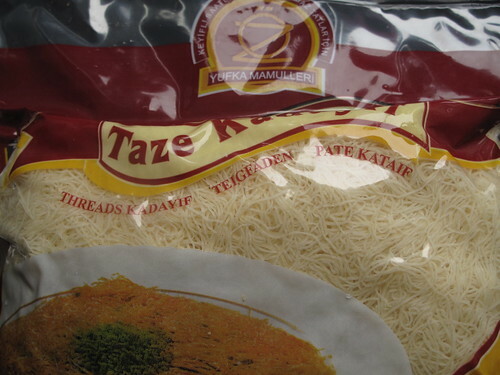 On this tour, I decided to make 2 easy recipes with Tel Kadayif (shoestring pastry), perfect for mezze. I’d say they were mix of experimental contemporary dishes! 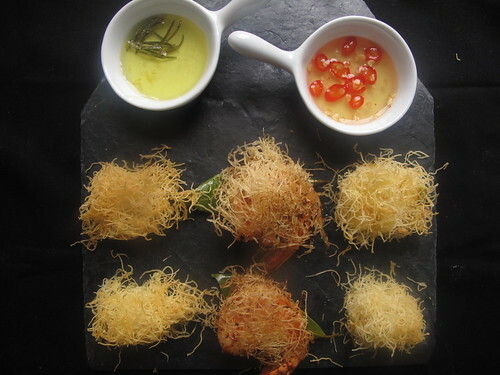 I was inspired by two things – watching a contestant in the British Masterchef professional Finals, wrap some prawns with pastry threads and a Knafeh Bil Jibne recipe from Swirl & Scramble, also on page 179 of Foodies of the World, you know the book in which recipes from my very self feature. Wanting some insider info, I accosted Ozkhan – my almost name-sake Turkish colleague. 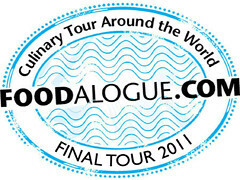 I told him I was travelling the world, via food and kitchen with Joan of Foodalogue on her 2011 Culinary Tour. The first thing he said was ‘I love gastro-tourism’. Aptly put. Born and raised in Istanbul, he describes the genesis of Turkish food culture as being ‘where East meets West’ – the synthesis of Arabic and Mediterranean cuisines. Doner kebabs and olive oil, co-habit peacefully and have done through the ages with such richness, diversity and colour as a Turkish rug. Even though there are points of union across Turkey, each region or area has its own ‘folk cuisine’ . The fantastic Turkish Cuisine Portal, (a useful resource on Turkish food, evolution and culture) says ‘Folk cuisine reflects the basic elements of the geography in which it (the cuisine) exists. All the products which nature provides are complimented with the foods created by mankind in harmony with nature, and it is upon this balance that culinary culture is founded. The search for innovation – and even a direct opposition to nature – is not to be found in folk cuisine, where everything is based on meeting a need and basic life functions. The local elements identifying folk cuisine – environment and climate – are directly reflected in eating habits. Grains, legumes, fruits and vegetables with meats and animal products are common across Turkey. 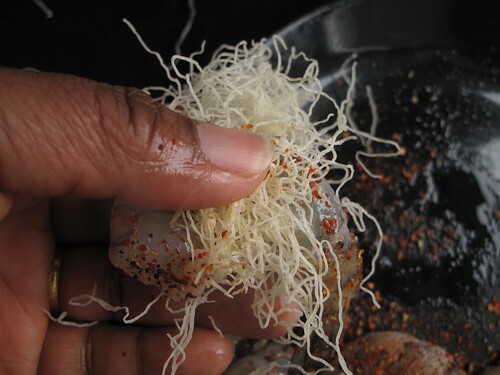 The difference is the way they are prepared or cooked, differing from region to region. Ozkhan makes me laugh with his descriptions of ‘Tel Kadayif’ which can be bought or made . The tradition of making it at home is mainly the preserve of grandmothers and mothers. He talks about young people his age/my age making it, in a ‘quick’ and easy way….unlike his grandmother did. His next point of differentiation – ‘commercial’ versus homemade. He says ‘The homemade version is light-textured when compared with the condensed, organised version of the ‘bakery’ shop. 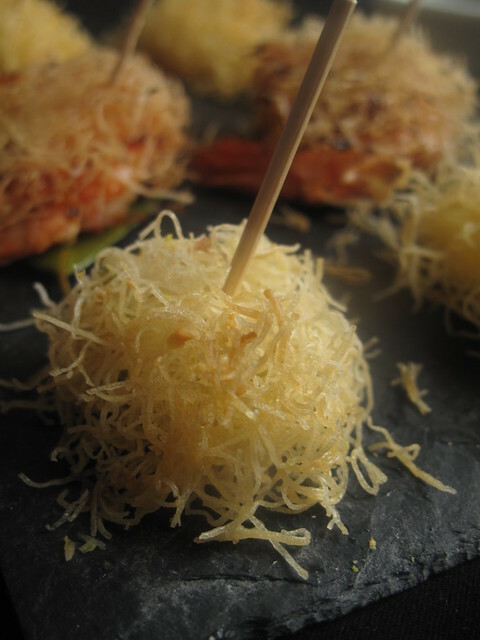 When I eat kadayif at home, I love the distinct layers – crisp and puffy on top, sweet and chewy at the bottom. I love the taste in my mouth. But when I’m hungry, I prefer the chewy, homogeneous, dense commercial kadayif; it tastes better in my stomach’. I laughed so hard because I ‘got’ it, I understood what he was trying to say! So what is Tel Kadayif? 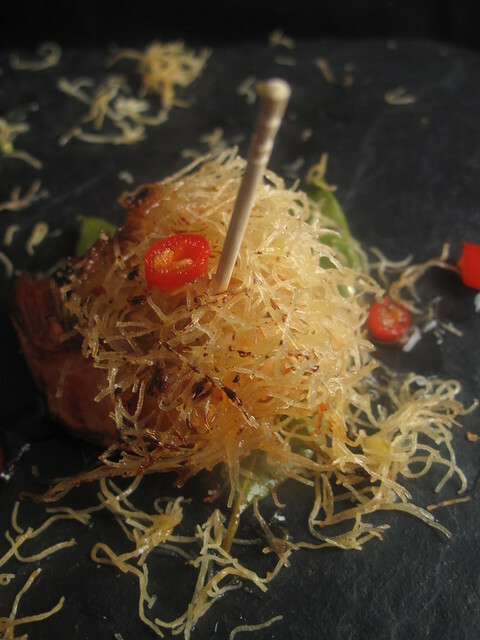 Essentially, it is fine vermicelli pastry, made from wheat and water. In Turkish, Tel means rope/strands/strings/wire and Kadayif means pastry. Other names: Shoestring pastry. 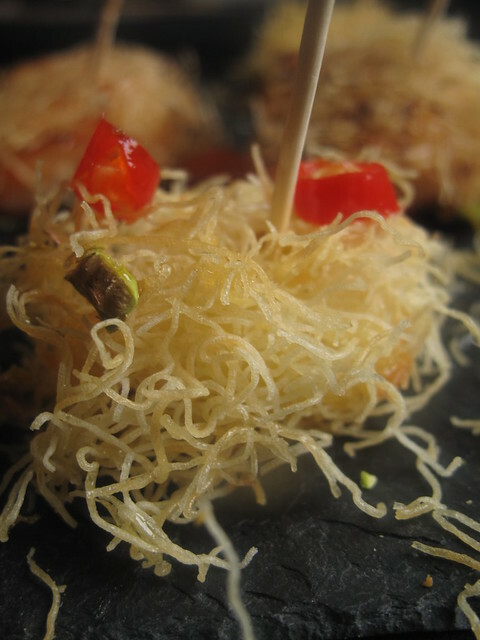 Vermicelli pastry. Shredded strands. Ropes. Pastry threads. 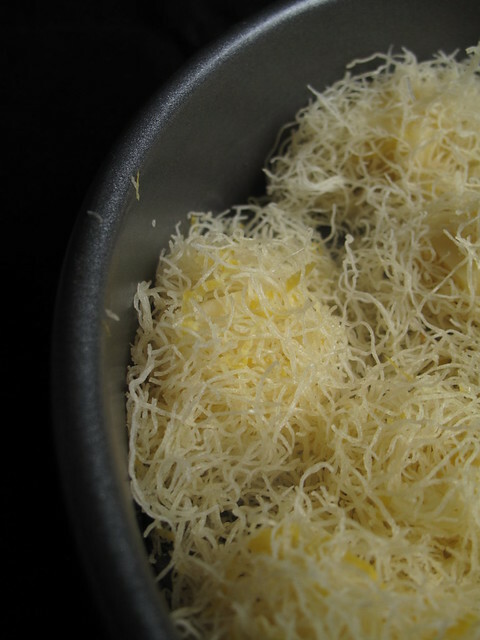 Shredded phyllo. Any alternatives? 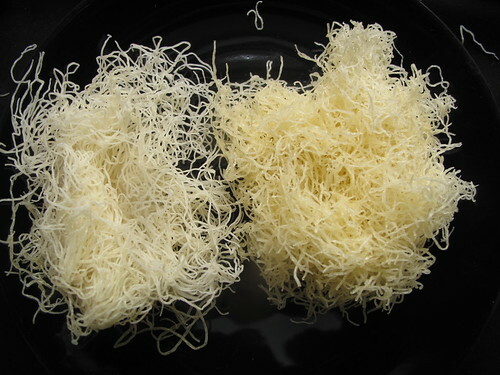 Yes, Shredded wheat according to Anni who said this on Chowhound: ‘…instead of the traditional “shredded dough” that is so difficult to find in the U.S., I use shredded wheat, a trick I learned from Turkish friends when I lived there. Kadayif can be made two ways. One is to break the shredded wheat into crumbles, and use it in layers. The second way is to pinch the seam carefully from each side of a biscuit of shredded wheat, then lay the “unglued biscuit” in the pan side by side and as close as possible to each other without stacking’. Because I’m blessed with a fantastic Turkish shop, I headed there to get my pastry and some cheese, excited at the prospect of making my first proper Turkish recipe. I also took the opportunity to buy a slab of Tel Kadayif, made with pistachios. Boy, it was a thick, dense mass of pastry, syrup and soaked, crushed pistachios……….extremely sweet and sticky. I had partial calibration and could agree in part to Ozkhan comments about ‘filling the stomach’ but I decided to wait till I completed the test with my homemade version. 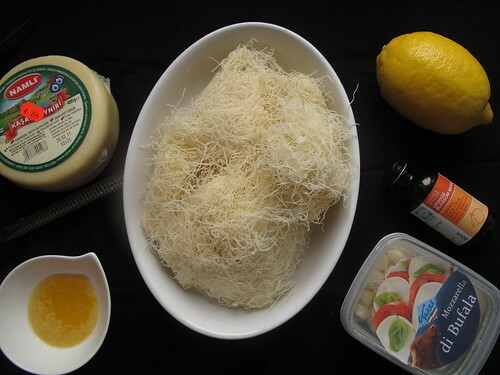 According to Saveur, Shredded phyllo dough (called Tel Kadayif in Turkey)—essentially the same delicately layered pastry as regular phyllo but processed into thin strands for a shaggier texture—is the base for many crunchy, sticky desserts across the eastern Mediterranean and the Middle East. 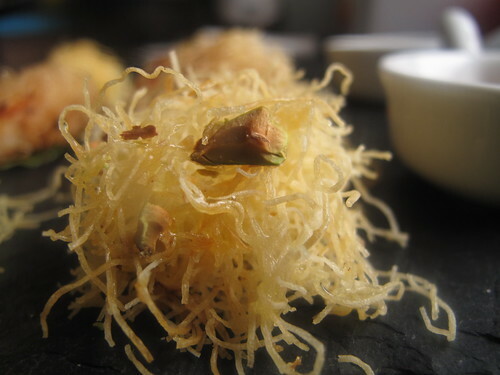 In the Turkish pastry called künefe, shredded phyllo is paired with fresh cheese and drizzled with sugar syrup; in the Greek pastry known as kataifi, the dough is stuffed with chopped walnuts, almonds, or pistachios and scented with orange or rose water. The ingredient is equally versatile for savory pastries. Made from nothing more than flour and water and usually sold frozen, it will dry out quickly if not properly handled and stored. 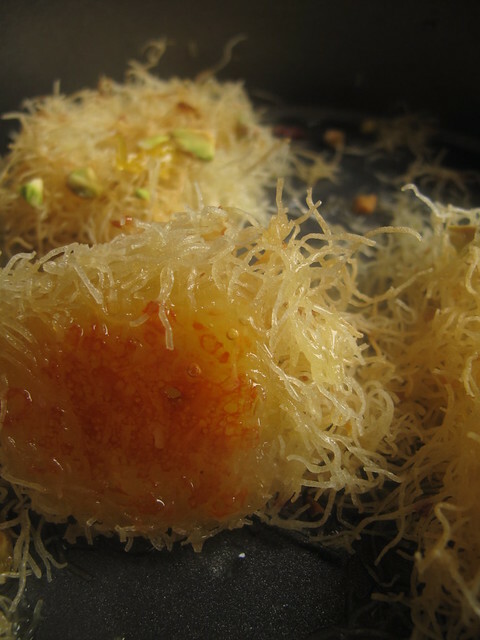 Brushing shredded phyllo with melted butter before baking helps to prevent sticking and cracking and gives desserts like kataifi their golden color. Thawed shredded phyllo should be stored in the refrigerator under a damp towel and wrapped tightly in plastic wrap; it will keep for about a week. 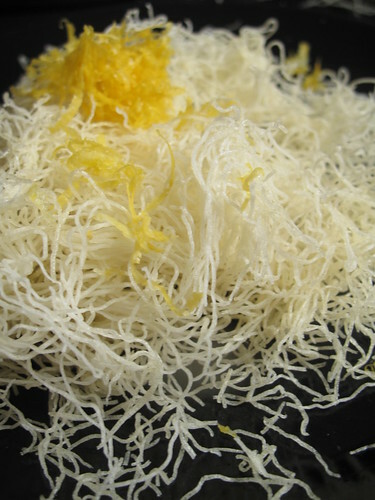 Frozen shredded phyllo can be found in the freezer case of most Middle Eastern food markets and in specialty stores. Traditionally, the baked pastry is finished off with some sugar syrup, often scented with rosewater or orange blossom water. I decided to infuse my syrups with typical Turkish herbs and spices. Defne, leaves of the Bay Laurel tree aka Bay leaves are used in various fish, meat, poultry and game dishes, in kebab, and in certain pickles and preserved foods; Ardıç, Juniper to you and I, is an evergreen tree bearing fragrant, blackish round berries. These are used in poultry dishes and in marinades for meat. Make the syrups ahead of time and refrigerate. Gently warm before using/drizzling over the pastries. 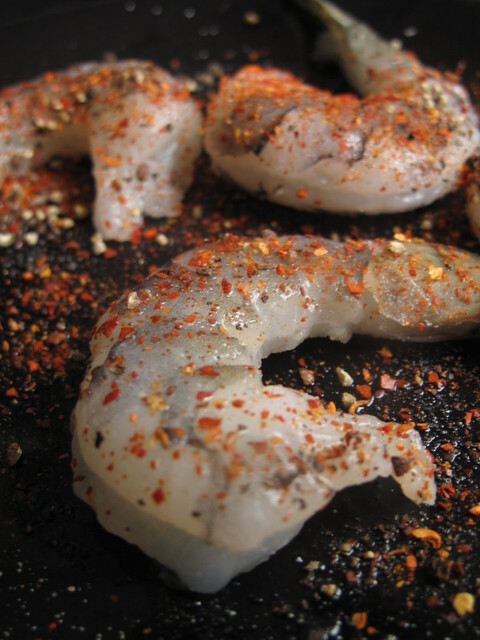 Dry prawns and season with salt and pepper. 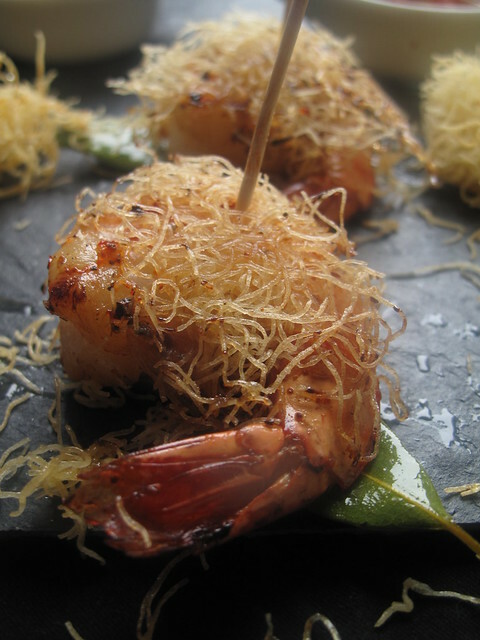 Remove a small quantity of pastry strings and wrap them around the prawns, leaving the tail free. 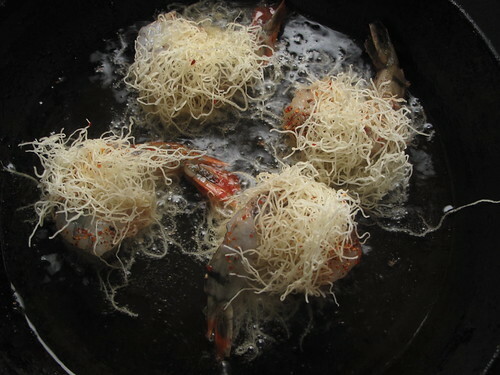 Heat some oil in a pan to deep fry the prawns. 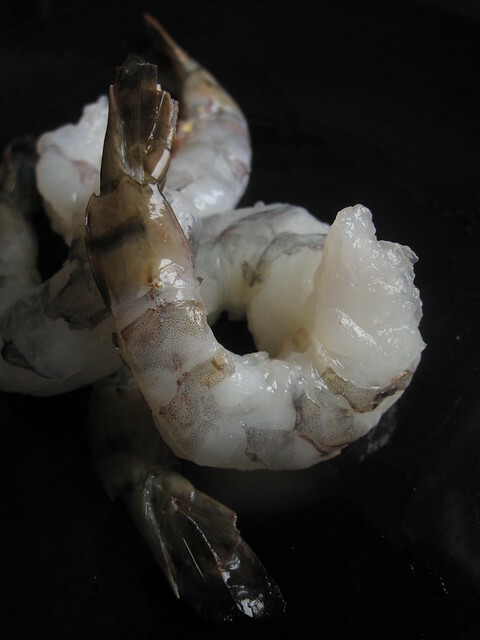 When the oil is hot and just a bit hazy, put the prawns in and let fry on the underside till golden, a couple of minutes. Flip over and let the other side cook, another couple of minutes. The prawns are ready when they are pink all over (the parts you can see) and the pastry is golden brown. Drain on tissues and serve with the lemon bay leaf syrup on the side, or drizzled over the top. Combine all the ingredients in a pan except for the chilli, on medium heat. Boil till reduced and a shiny, sticky syrup is formed, about 5 minutes. Add the chilli, stir and leave to infuse for a few minutes before using. Serve warm. Preheat the oven to 180 degrees C (360 degrees F) and grease a baking pan with some butter. 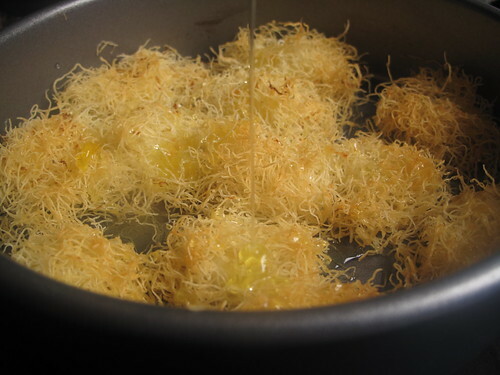 Put the Tel Kadayif in a bowl then dip your hands into the melted butter and remove a small quantity of pastry. 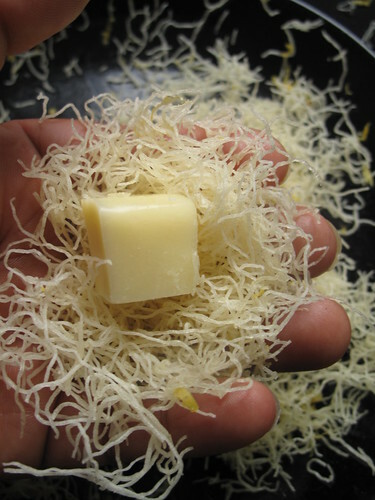 Gently massage the melted butter into the strands such that they are coated. Repeat for the remaining quantity so that the butter is evenly distributed – this prevents the pastry from sticking, cracking and drying out. 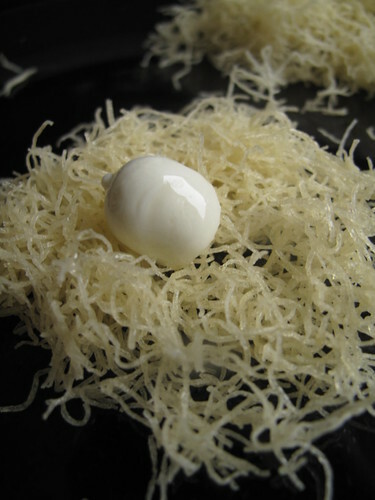 You’ll notice that the off-white unfattened pastry transforms into light yellow/golden strands. The baked result will be even more golden and attractive to the eye. Next step, remove a small portion of buttered dough and place a piece of cheese in the centre. Roll it into a small sausage or a ball of wool and place in the buttered pan. Repeat till you’ve made the quantity you want or till the pan is full. To see if the pastry could be lifted with some citrus flavour, I stirred in some micro-planed lemon zest into a handful of pastry and nestled a cube of kasar cheese in the centre. 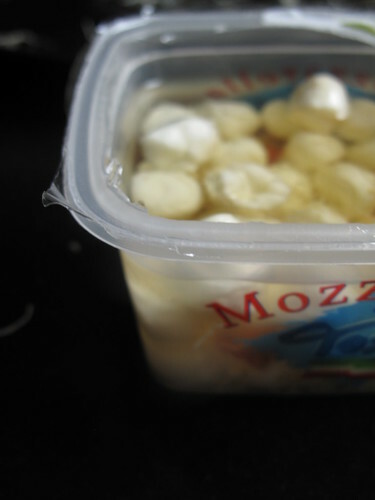 A repeat of the rolling occurred, far from perfect but sufficient to encase the cheese safely. Place the pan in the centre of the oven and bake for about 15 minutes. Start checking on its readiness after 10 minutes. It is ready to come out when it’s taken on the heat of the oven and turned a gorgeous golden colour – I panicked, not wanting my pastry to burn as I’d read the difference between golden and burnt could be a matter of seconds. Needless to say, the fair tones did nothing to affect the flavours but back to the recipe. 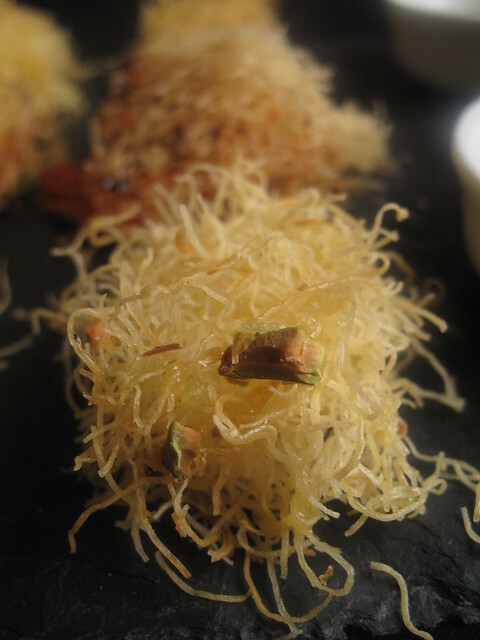 Remove and drizzle the warm syrup over the top and garnish with your choice of chopped nuts and candied fruit. I loved the resulting bed nests, with their golden translucent strands, trapping all manners of delights. For fancy pants serving this up to esteemed guests, let rest for a few minutes and then remove the portions required onto a platter, impale with a toothpick or dainty skewer and smile. Feel free to serve extra syrup on the side. Combine all the ingredients in a pan except for the orange blossom water which should go in at the end. Gently cook the syrup on medium heat till reduced and a shiny, sticky syrup is formed, about 5 minutes. Remove from the heat and stir in the orange or rose water. Use/serve warm, discarding the rosemary fronds. 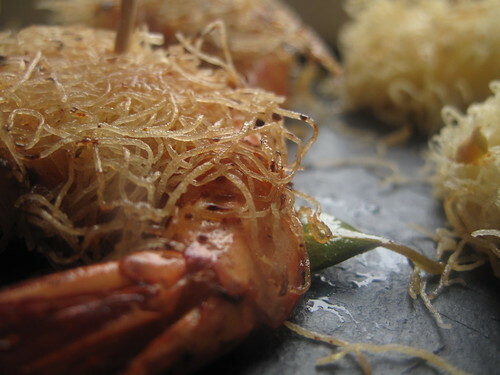 The prawns were absolutely delicious. Sweet, well seasoned with the delightful crunch of the delicate, fried pastry. A great combination which to me tasted extremely Asian. But then, I haven’t seen this specific recipe in any Turkish cookbook. The syrup was nice – herby, fragrant with the sweetness of the lemons and the spice of the fresh bay leaf and juniper berries, with a very welcome kick from the red chilis. This was so easy to put together that it will be a party of my Hors D’Oeuvre repertoire.